Origin: Italy, made since 1952. I had Cynar for the first time in 2008 at a place called La Groceria, an Italian restaurant in Cambridge, Massachusetts that had been around for 37 years. The restaurant was closing down and we were taking stock, and from the depths of the lowest shelf was pulled an fading bottle of Cynar, encased in so much dust we could barely tell there was liquid left in it. No one could remember where it came from. Charlie, the owner, swore it had been there since the late 80s. Of course, the inevitable — “What does it taste like?” his son Matt asked — and we were soon betting each other to try. At 16.5% alcohol it wasn’t immune to the ravaging of time, and the decades had left it with the viscosity and color of used motor oil. I knew nothing whatsoever about it, just that the label featured an artichoke busting into the foreground like a cartoon superhero, and everyone seemed to agree that a small sip would be worth five dollars. It was then, and remains now, the worst thing I’ve ever had. Fortunately, bottles that haven’t long ago given way to decay are significantly more palatable. Which is not to say that it is not challenging. Those with no exposure to potable bitters will dislike it the first time they have it, and look at you with a face of wounded betrayal, like a dog when you take it to the vet. A face that says, “I thought we were friends… why are you doing this to me?” While it comes sweet at first, the finish is a distinct and robust bitter mixture of earth and copper, like a mouthful of pennies mixed with topsoil. But in a good way. 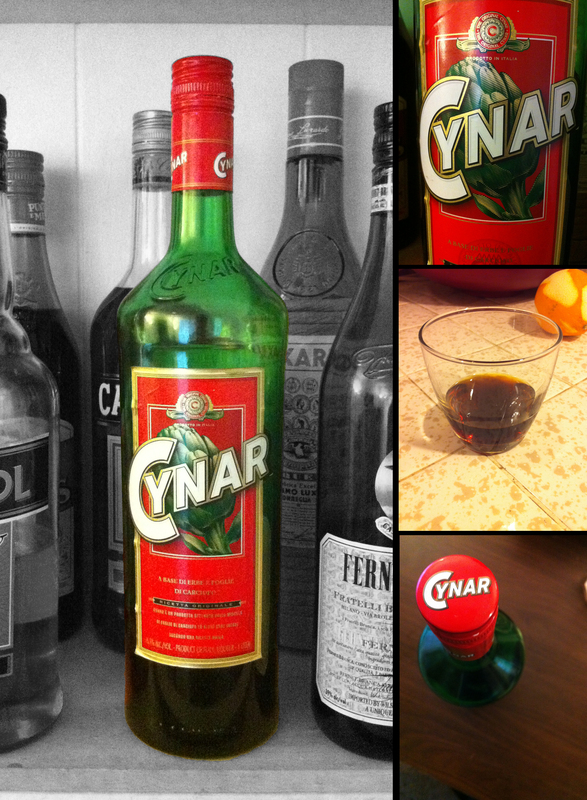 Cynar is one of the crucibles of the craft cocktail world, one of those things that cocktail people use to tell other cocktail people because of the inherent hurdles involved with (1) finding a bottle behind a bar, (2) finding a bartender who has the slightest inclination to use it, and (3) overcoming the obvious mental difficulties in purposefully ordering a cocktail featuring an artichoke. But like most all the Amari, once embraced it can be a delightful liqueur, and one that can give incomparable depth of flavor to cocktails. Its bitterness isn’t quite as sharp as Campari’s but is much fuller and rounder and more reminiscent of earth than Campari’s rust. It also features a nice sweetness that leads the palate to the pronounced bitter finish. Like Campari and Aperol, it’s artificially but appropriately colored, with dark orange hues in dark brown base that give a hint of what’s to come. 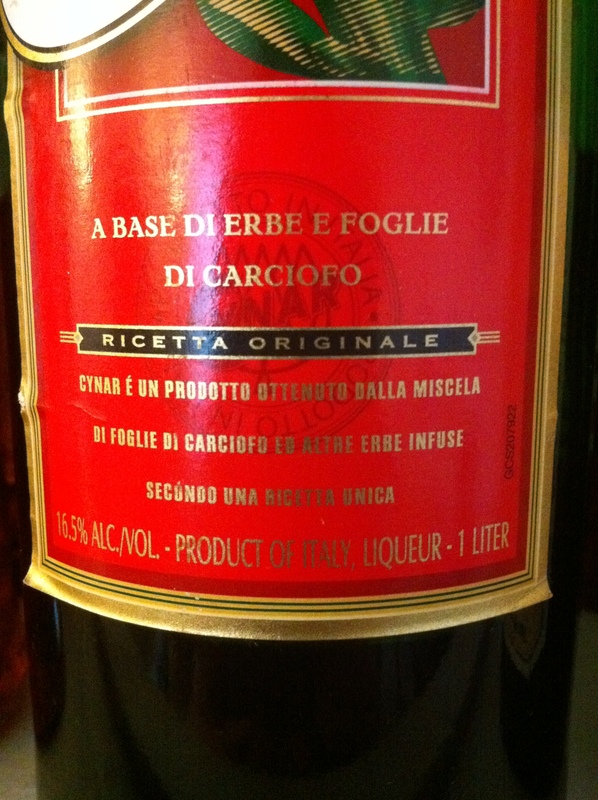 In my experience, it is most successfully mixed with gin as a base, or with some of its Italian brothers. Its role in cocktails is definitely to deepen or enrich. Things that are too sweet or light could do with a small dose of Cynar, or really anything that wants some robust earthy fullness. Sweet vermouth and Cynar (with a pinch of salt) makes a Bitter Giuseppe, and it can be layered with about 5 other bitters to make an Autumn Negroni. View the full list of cocktails here. Trivia! : Unlike what I’ve heard at least one uninformed douche tell someone, “artichoke” in Italian is not Cynar but “carciofo.” The name Cynar comes from the Latin genus of the artichoke, Cynara cardunculus.